Welcome to Gator Harley-Davidson® in Leesburg Florida, just North of Orlando and south of Ocala. We are a family owned and operated dealership. Two generations of Malik's have run the day-to-day operations since 1993. Our facility spans 70,000 sq. ft. with areas for MotorClothes® apparel, parts and accessories, new and used motorcycles, and much, much more. Our service department is staffed by highly educated and experienced professionals. Come down and see what we have to offer you. We're sure you won't be disappointed. Find out how our team can help you find the Harley-Davidson® you’ve been looking for! We look forward to the opportunity to serve you. 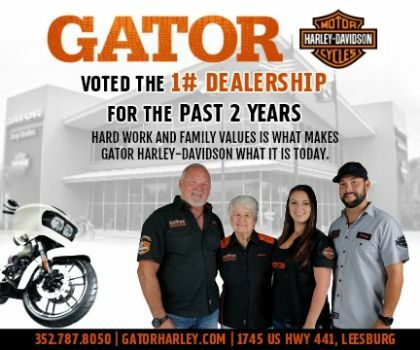 Gator Harley-Davidson® is conveniently located near the areas of Leesburg, Eustis, Tavares, Mt. Dora and Lady Lake.